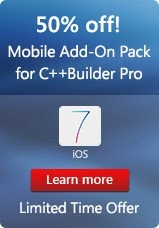 If you're using Delphi Professional or C++Builder Professional and don't have XE5 with the Mobile Add-On Pack yet, there is a great limited time offer to get you to XE5 with mobile. Add mobile development to your XE5 Professional edition IDE and expand your app development beyond the desktop to iOS (for Delphi and C++Builder) and Android (for Delphi). Now you can use your favorite desktop application development tool to create mobile apps too! As you can guess by the name, the Mobile Add-On Packs require either Delphi XE5 Professional or C++Builder XE5 Professional. Considering a different edition? Delphi and C++Builder Ent/Ult/Arch editions and all editions of RAD Studio XE5 include mobile capabilities with no add-on pack needed. Special limited time offers are available on those product editions including free additional software and the Coding in Delphi ebook by Nick Hodges.